I do love a cold Sunday morning sipping hot coffee and planning a delicious Sunday dinner… that will take a good part of my day to prepare. Yes, I love those meals that take entirely too long to chop all the veg, dirty up all the pots in the kitchen and ultimately fill my house with an aroma I won’t get from a 30 minute meal. Those days are more plentiful recently, but some meals are meant to be simple. Like fish. 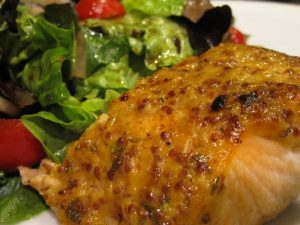 This Mustard and Herb Crusted Salmon is so simple but tastes like a million bucks in less than 10 minutes. The cooking method requires only broiling but make sure to use the middle oven rack. I had rosemary & thyme still growing but use any herb you have on hand and if you don’t have fresh, by all means use dried (just use 1/2 the amount as dried is more potent than fresh). In a small bowl combine garlic, rosemary, thyme, oil, Dijon mustard, whole-grain mustard, honey and lemon juice. Line a baking sheet with foil. Spray the foil with nonstick spray or drizzle a little olive oil. Arrange the salmon fillets on the baking sheet and season with salt and pepper. Broil for 2 minutes. Remove from the oven and spoon the mustard sauce over the fillets. Continue broiling until the fillets are just cooked through and golden brown, about 5 minutes longer. Remove from oven and let rest for 2-3 minutes before serving. All I can say is this is HEAVENLY!!! Since I've been anti-cooking for so long, this is easy and SOOOOO GOOD. I'm not sure if I love the little burst of lemon flavor or the after taste of the herbs that just kind of lingers in my mouth. Either way I'm loving it!! !